Re-posted with permission: Copyright 2011-3011 Chase Kyla Hunter & Alternative News Report, All Rights Reserved. All re-posts must leave all content, author, blog name, original URL location & copyright stamp intact. Love this news blog? Shop here & support it! Numerous astute weather watchers and citizen journalists have identified very large HAARP rings inside of or adjacent to Hurricane Irene. I took this still shot from a video in the list below. It seems to originate from a radar facility in Raleigh NC and is large enough to cover the entire eastern region of North Carolina. What are these bizarre colossal HAARP radar flashes and what are they intended to do? Weather watchers want to know. The fact that the American people no longer trust their government has long been established by citizen journalists in the past few years, specifically since the Obama era began. But pending natural disasters bring out those moments of questioning even more so. I located some videos this morning that I wanted to share. My posting of these is neither a negation, nor an agreement with the musings therein. But I always take note of individuals who do not run with the herd, and who insist on thinking for themselves about what they observe taking place in our country. Either our Illuminati-gone-wild federal government is trying to break up and dissipate the hurricane to avoid multiple natural disasters, or just the opposite – they are actually trying to exacerbate and amplify the storm. You decide. Many are now wondering whether a mandatory evacuation was really necessary in this weather event, but we cannot answer that until the weekend is over. If lives have been saved, then yes, a mandatory evacuation was the proper thing to do. At the last possible minute, Obama returned from vacation and has put on a very big show of “taking command” with hurricane Irene now at landfall. 2012 Photo Ops. Everything he does now is geared toward “looking presidential” enough to win again in 2012. That vacation was really ill timed and there are entirely too many vacations going on while the business of the nation falters and flails about. I’ve been writing for four years now about UN and US DOD HAARP Project Blue Beam. The UN documents describing Project Blue Beam and how the NWO and UN plan to use the actual projection of “indoctrinating holograms” onto the atmosphere itself to create convincing but fraudulent “second coming” imagery are located on my original Wiki and have been hidden there in plain sight for four years. This is the NWO‘s most ludicrous, heinous and preposterous plan yet for trying to install a one world government on the unsuspecting people of the world, by employing the ultimate in faked imagery to try to achieve their goals. Every American and every person on earth who can understand this post needs to realize that they can’t possibly pull this off if the people of the world know what they are doing with these projected images. The documents shown in the video below ARE REAL. They literally prove, once again, that what writers and researchers like me have been mocked for trying to explain and reveal to people for years, is not just conspiracy theory, but solid Black Ops hard science and fact. They intend to try to do this and it all ties in with the advent of “Maitreya” and the so called “Day of Declaration” which has long been planned by the UN, which sponsors “Maitreya” and Share International, his online presence. Now adding to the evidence which I have detailed exhaustively for years avout all this, YT citizen journalists have uncovered government documents which explain in exhaustive detail how barium and strontium micro-particles in the atmosphere can be used to receive and hold projected holographic images. This video below clinches it for me. It’s smoking gun evidence that puts the capstone on the people’s revealing of the dirty little secrets their government is and has been up to since the early 1980s when HAARP technology was first developed. There are being planned and tested many secret uses for HAARP technology that circumvent due process of congress, and the entire HAARP program needs to be investigated and brought under public and legal scrutiny immediately, before the runaway mad scientists operating this technology plan any more heinous uses for it. Here is the video and below it are links to the many articles and essays I have written about HAARP technology and the ungodly plans our government has made for some very WRONG uses of it. Thailand Spiral More Ominous than Norway Spiral: Maitreya False Signs & Wonders again? Norway Spiral Coincides With Obama Peace Prize Reception: Is There A Connection? Will The REAL Second Coming Take Place In Our Present Generation? In January 2010 I posted a web article, video clips and related science documents that had captured the most bizarre aerial manifestation seen in modern times. The HAARP rings which were caught on radar during that event, which were seen and documented by thousands of people in Australia, along with radar technicians, astronomers and other scientists, were almost as large as the state of Texas. These man-made HAARP rings were colossal in size. No official explanation has ever been provided for what these enormous “spiraling rings” over Australia were one year ago, and now, one year later, they have appeared again. What the hell is going on in our skies? We need to demand answers and explanations. Copyright 2011-3011 By Biblical Times, All Rights Reserved. Just Exactly What Are the HAARP Scientists Really Doing? Copyright 2011-3011 Alternative News Forum, Reposts Permitted Keeping LInkback Intact. Since this information is already in the public domain in PDF form I thought readers would be interested to peruse this HAARP bibliography from 2000-2007 and see what kinds of reports and papers have been written on a variety of toipics. Truth researchers, knock yourselves out. Go for it. Kondabarov, A. V. (2000). Satellite and ground-based measurements of the SAR-arc phenomena. Physics and Chemistry of the Earth C, 25(1-2), 63-66. Space Agency (Special Publication), ESA SP(476), 331-336. AFRLVSHATR20041125 // ADA427533). Northwest Research Associates, Inc., Bellevue, WA. ADA401954). Northwest Research Associates, Inc., Bellevue, WA. Research Associates, Inc., Bellevue, WA. propagation. (Report No. NWRACR98R177 // AFRLVSHATR980037 // ADA3456787). Northwest Research Associates, Inc., Bellevue, WA. transionospheric systems. (Report No. NWRACR02R247 // AFRLVSTR20031540 // ADA417708). 8. Anonymous. (1995). Alaskan details risk of High-Frequency Active Auroral research program in book. 10. Anonymous. (1993). Environmental impact analysis process. Final environmental impact statement. Part 2. Force Materiel Command, Wright-Patterson AFB, OH. Research Program. (Report No. ADA2676419). Phillips Lab., Hanscom AFB, MA. 12. Anonymous. (1994). Establishing the National Polar Radio Science Consortium. (Report No. ADA2792307). University of Alaska Fairbanks, Geophysical Institute, Fairbanks, AK. ionospheric heating. Geophysical Research Letters, 26(21), 3285-3288.
ionosphere in its heating. Izvestiya Vysshikh Uchebnykh Zavedenij, 45(11), 8-9.
winter at solar maximum. Annales Geophysicae, 18(11), 1435-1446. Engineering Conference. IEEE: USA. Pp.97216, 1317-1322. Notes: Continued in Electrochemical technologies conversion technologies thermal management. transmitters. Advances in Space Research, 5, 667-687. HAARP using long-path VLF diagnostics. (Report No. AFRLVSTR20011573 // ADA405592). Stanford University, Space Telecommunications and Radioscience Lab, CA. signals from the HAARP facility. Geophysical Research Letters, 31(6), L06811 1-5.
ionosphere. Radio Science, 36(5), 1209-1220.
pumped artificial airglow. Journal of Geophysical Research, 105(A5), 10657-10671.
ionosphere-magnetosphere system. Advances in Space Research. modified Auroral ionosphere during magnetospheric substorm. Radio Science, 34(3), 715-724.
of Geophysical Research, 106(4), 6029-6041. 32. Busch, L. (1997). Ionosphere research lab sparks fears in Alaska. Science, 275(5303), 1060-1061. 33. Bösinger, T., Pashin, T., Kero, A., Pollari, P., Belyaev, P., Rietveld, M., Turunen, T., & Kangas, J. (2000). 35. Chavka, G., & Sadowski, M. (2005). EMC analysis of double-band antenna of ionospheric station HAARp. Electromagnetic Ecology, 2005, Proceedings, 104-107.
observations. Physics of Plasmas, 8(3), 802-812. Chemistry of the Earth C, 25(5-6), 563-566. Chemistry of the Earth B, 25(5-6), 439-442. 41. Cole, K. D. (2001). Saturated heat conduction and joule heating in the Venus ionosphere by 100 Hz fields . Journal of Geophysical Research, 106(A7), 12953-12961.
power pulse at the eletron plasma frequency. Geophysical Research Letters, 32(8), L08101 1-4. 44. Danilov, A. D., & Lastovicka, J. (2001). Effects of geomagnetic storms on the ionosphere and atmosphere. International Journal of Geomagnetism and Aeronomy, 2(3). in Van Allen belts. Fusion Technology, 35(1T), 312-314. July 27-31, 1998, 35(1T), 312-314.
observations of the Viking spacecraft. Advances in Space Research, 32(3), 323-328.
morphology in the CRRES. Journal of Geophysical Research, 106(A10), 21289-21295. 50. Demirkol, M. K. (2000). VLF remote sensing of the ambient and modified lower ionosphere, Ph.D.thesis. neutral particles. Radioelectronics and Communications Systems, 48(10), 47-52.
before earthquakes. Geomagnetism and Aeronomy, 40(6), 728-732. 53. Djuth, F. T., & Elder, J. H. (2000). Electromagnetic Diagnostics of Atmospheric Plasmas. (Report No. GRI-BA-00-7250 // AFRLVS-TR-2000-1522). Geospace Research, Inc., El Segundo, CA. asssessing the response of the ionosphere during HAARP modification experiments . (Report No. Inc., El Segundo, CA. National Aeronautics and Space Administration, Washington, DC . 56. Djuth, F. T., Pedersen, T. R., Gerken, E. A., Bernhardt, P. A., Selcher, C. A., Bristow, W. A., & Kosch, M.
HF-induced large-scale irregularities above HAARP. Geophysical Research Letters, 33(4), L04107. ionospheric rage delay. Proceedings of ION GPS, 2, 1589-1598. AP and a pair of SuperDARN radars. Journal of Geophysical Research, 106(A1), 261-274. 61. Duncan, L. M. (1995). Investigation of ionospheric disturbances and associated diagnostic techniques . (Report No. PLTR942309 // ADA3077971). Clemson University, SC. Atmospheric and Solar-Terrestrial Physics, 59(18), 2409-2414. 64. European Geophysical Socieety. (2000). Annales Geophysicae: Special Issue, 18(9), 993-1255.
military applications. Jane’s Defence Weekly, 23(13), 21-22.
bands by modulated ionospheric current. (Report No. SCIENTIFIC3 // ADA2749695). Pacific-Sierra Research Corp., Los Angeles, CA. 67. Frank, L. A., & Paterson, W. R. (2000). Observations of plasmas in the Io torus with the Galileo spacecraft. Journal of Geophysical Research, 105(A7), 16017-16034.
plasma-density disturbances that may impact GPS and other transionospheric systems. (Report No. soalr maximum. (Report No. NWRACR00R225 // AFRLVSTR20011538 // ADA419928). 72. Frolov, V. L., Ermakova, E. N., Kagan, L. M., Komrakov, G. P., Sergeev, E. N., & Stubbe, P. (2000). ionosphere and thermosphere. Advances in Space Research, 25(1), 213-218.
aluminum release. Journal of Geophysical Research, 106(A10), 21495-21502.
propagation in the atmosphere-ionospehre-magnetosphere. (Report No. AFRLVSTR20011505). potential transmitter sites for the HF active auroral research program (HAARP). (Report No. MRLMR5554937375 // ADA2677433). Naval Research Lab., Washington, DC. 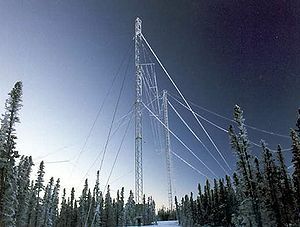 potential transmitter site for the HF active auroral research program (HAARP). (Report No. NRLMR5554947622 // ADA2889095). Naval Research Lab., Washington, DC. 79. Goodman, J. M. (2002). 2002 Ionospehric Effects Symposium. JMG Associates Ltd., Alexandria, VA.
Notes: Held in Alexandria, VA on May 7-9, 2002. 710 pages. 80. Gordon, W. E. (1997). 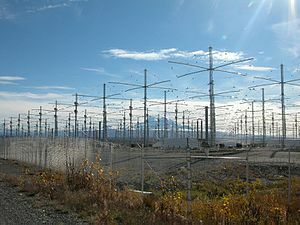 HAARP facility in Alaska. Science, 275(5308), 1861-1861.
the OEDIPUS-C sounding rocket . Advances in Space Research, 21(5), 705-708.
facilitites. (Report No. SPC-99-4026 // EOARDSPC-99-402). Fizicheskii Institute, Moscow, Russia. facilitites. (Report No. EOARDSPC-00-4010). Fizicheskii Institute, Moscow, Russia. perturbations in ionospheric modifications. Physics Letters A, 301(3-4), 307-314.
heated region in ionospheric modification. Physics Letters A, 288(3-4), 231-239.
modifications. Physics Letters A, 305(5), 264-274.
operations. (Report No. 851330). SAE Technical Paper Series. mountain associated waves using infrasonic data and a backpropagation neural network . Proceedings of SPIE – The International Society for Optical Engineering, 3722, 344-356.
heating and auroral arc formation. Geophysical Research Letters, 27(11), 1635-1638.
and Defense). (Report No. FOI-R-0188-SE). Swedish Defence Research Agency, Stockholm. 95. Huba, J. D., Joyce, G., & Fedder, J. A. (2000). Ion sound waves in the topside low latitude ionosphere. Geophysical Research Letters, 27(19), 3181-3184.
heater-induced upper hybrid waves. Geophysical Research Letters, 30(24), SSC 13-1 to SSC 13-4.
ionospheric stimulated radiation. Radio Science, 32(5), 2099-2107. Assembly, Held 16-23 July 2006, in Beijing, China, 3563.
emissions exciteid by the HAARP HF heater. Geophysical Research Letters, 31(24), L24805 1-4.
ionosphere: first results from OERSTED. Geophysical Research Letters, 28(1), 103-106.
the ionospheric E-region. Journal of Geophysical Research, 105(A3), 5291-5303.
summer echo observations at HF frequencies using the HAARP Gakona Ionospheric Observatory . Geophysical Research Letters, 29(12), 44-1 to 44-4 . Electrical and Computer Engineering, Ithaca, NY. airwaves and the ham press have been filled with wild rumors about this exotic government project. Here’s the truth about HAARP. QST, 80(9), 33-35.
radio wave ionospheric heating. Radio Science, 33(1), 143-148. 113. Knipp, D. J., Emery, B. A., Engebretson, M., Li, X., McAllister, A. H., Mukai, T., Kokubun, S., Reeves, G.
Conference, 1995: Conference Proceedings, 233-236.
the EISCAT incoherent radar. Advances in Space Research, 20(6), 1133-1136.
second electron gyro-harmonic. Annales Geophysicae, 23(5), 1585-1592. 118. Kosch, M. J., Pedersen, T., Mishin, E., Oyama, S., Hughes, J., Senior, A., Watkins, B., & Bristow, B.
and Chemistry of the Earth B, 25(5-6), 475-481. 2006, in Beijing, China, 2568. AFB, MA. Space Vehicles Directorate. when a heater affects the polar ionosphere. Geomagnetism and Aeronomy, 41(3), 343-350. 125. Kotikov, A. L., Pudovkin, M. I., Pashin, A. B., Grazhdantseva, E. Yu., Bosinger, T., & Rietveld, M. T.
frequency heating waves. 2002 IEEE International Conference on Plasma Science, Banff, Canada. on Plasma Science, Banff, Canada. Picataway, NJ. ELF radiation. Geophysical Research Letters, 34(5), L05103. modulated HF waves in the polar electrojet. Geophysical Research Letters, 26(12), 1677-1680.
experiments. Journal of Geophysical Research, 110, A01309, doi:10.1029/2004JA010674, 2005. ELF and VLF wave generation in the polar electrojet. Geophysical Research Letters, 27(1), 85-88.
resonance in ionospheric HF heating experiments. Geophysical Research Letters, 32(19), L19102. from the early polar cap observatory. Radio Science, 36(6), 1859-1868. 144. Lance, C., & Eather, R. (1993). High Frequency Active Auroral Research Program (HAARP) Imager. (Report No. ADA2774693). Keo Consultants, Brookline, MA. temperatures at auroral latitudes. Advances in Polar Upper Atmosphere Research, 14, 1-11. 147. Liemohn, M. W., Kozyra, J. U., Richards, P. G., Khazanov, G. V., Buonsanto, M. J., & Jordanova, V. K.
148. Liperovsky, V. A., Pokhotelov, O. A., Liperovskaya, E. V., Parrot, M. M. C. V., & Alimov, O. A. (2000). 149. Livingston, R. C. (2002). Global ionospheric structure, dynamics, and system effects. (Report No. AFRLVSTR20021593 // ADA406637). SRI International, Menlo Park, CA. characterization. 1998 IEEE Radio and Wireless Conference, 1998: RAWCON 98, 109-112. Communications, 1998, Waltham, MA, USA, 97-100. 153. Lu, G., Richmond, A. D., Ruohoniemi, J. M., Greenwald, R. A., Hairston, M., Rich, F. J., & Evans, D. S.
ionospheric electrodynamics. Journal of Geophysical Research, 106(A1), 417-433.
thermosphere. Journal of Atmospheric and Solar-Terrestrial Physics, 63(4), 355-366. AFRLVSTR19991511 // ADA398268). GSY-USA, Inc., San Francisco, CA. heating experiments.”. Physics of Plasmas, 9(8), 3639-3640. 159. Mikhailov, Yu. M., Oraevsky, V. N., Sobolev, Ya. P., Dokouking V.S., Kapustina, O. V., & Afonin, V. V.
Chemistry of the Earth C, 25(1-2), 67-70. Goodrich, C. C., Rosendberg, T. J., Weatherwax, A. T., Wiltberger, M. J., Lyon, J. G., & Fedder, J. A. (2001). Modeling ionospheric absorption modified by anomalous heating during substorms. Geophysical Research Letters, 28(3), 487-490. D-region by the HF Active Auroral Research Program facility. Radio Science, 29(5), 1355-1362.
considerations. Annales Geophysicae, 23(1), 47-53.
of Geophysical Research, 109(A2), A02305 1-10. Commerce & Pacific Rim Reporter, 20(27), 3-13. Journal of Commerce & Pacific Rim Reporter, 19(41), A. 174. Oyama, K.-I., Abdu, M. A., Piel, A., & Thiemann, H. (2000). What is hapening near S<<SUBq>>focus? Advances in Space Research, 26(8), 1263-1266. 175. Oyama, S., Watkins, B. J., Djuth, F. T., Kosch, M. J., Bernhardt, P. A., & Heinselman, C. J. (2006). at HAARP. Journal of Geophysical Research, 111(A6), A06309. research and applications. (Report No. ADA355641). Naval Research Lab., Washington, DC. of the ionosphere to pulsed HF heating . Geophysical Research Letters, 32(13), L13101 . using HF heating of the auroral electrojet. Plasma Physics Reports, 29(7), 561-565. 16-23 July 2006, in Beijing, China, 1443. Atmospheric and Solar-Terrestrial Physics, 63(6), 605-616.
frequency active auroral research program facility: Thermal excitation and spatial structuring . high-power radio waves. Nature, 433(7025), 498-500. 186. Pederson, T. R., McCarrick, M., Gerken, E., Selcher, C., Sentman, D., Carlson, H. C., & Gurevich, A. (2003). Magnetic zenith enhancement of HF radio-induced airglow production at HAARP. Geophysical Research Letters, 30(4), 18-1 to 18-4.
magnetoplasma to an external current source. ICOPS 2004: IEEE Conference Record – Abstracts. The 31st IEEE International Conference on Plasma Science, 427.
ionosphere: an observational campaign. Journal of Geophysical Research, 105(A4), 7403-7417.
waves injected with the HAARP HF transmitter. Geophysical Research Letters, 33(16), L16101. 191. Platino, M., Inan, U. S., Bell, T. F., Pickett, J., Kennedy, E. J., Trotignon, J. G., Rauch, J. L., & Canu, P.
ionosphere with the HAARP HF transmitter. Annales Geophysicae, 22(7), 2643-2653.
program ionospheric research instrument (HAART IRI): General Analysis. (Report No. AFRLHEBRTR20000060 // ADA379626). AUSA, Cupertino, CA. 193. Ponomarenko, P. V., Yampolski, Y. M., Zalizovsky, A. V., Hysell, D. L., & Tyrnov, O. F. (2000). observations of currents and waves in space plasmas. Laser and Particle Beams, 6(3), 503-511. Space Agency (Special Publication), ESA SP, 309-312.
rocket. European Space Agency (Special Publication), ESA SP, 29-34.
mid-latitudes during auroral substorms. European Space Agency, ESA SP(443), 561-564. 199. Reinisch, B., & Sales, G. (2004). Imaging and forecasting of ionospheric structures and their system impacts. Lowell. Center for Atmospheric Research. proposed emitters for the high frequency active auroral research progarm (HAARP) . (Report No. by field aligned drifts in the lower ionosphere. Annales Geophysicae, 18(7), 799-806. CUTLASS-EISCAT heating results. Advances in Space Research, 21(5), 663-666.
the Auroral electrojet. Geophysical Research Letters, 27(19), 3165-3168. Initial results of high power radiowave interactions with space plasmas. (Report No. 209. Rodriguez, P., Kennedy, E., & Kossey, P. (2003). High frequency radar astronomy with HAARP. Proceedings of the 2003 IEEE Radar Conference, 2003, 154-159. 2004, in Santa Fe, New Mexico, USA, 171. HAARP, HIPAS, and WIND. Geophysical Research Letters, 26(15), 2351-2354. Engebretson, M., Kaiser, M. L., Desch, M. D., Goetz, K., Bougeret, J.-L., & Manning, R. (1998). plasmas. Geophysical Research Letters, 25(3), 257-260. 214. Rodriguez, P., Kenneydy, E. J., Kossey, P., McCarrick, M., Kaise, M. L., Bougeret, J.-L., & Tokarev, Y. V.
Center for AeroSpace Information (CASI). 215. Rodriguez, P., Keskinen, M. J., Kennedy, E. J., McCarrick, M., & Preston, J. (1999). ADA362758). Naval Research Lab., Washington, DC. Plasma Physics Division. 217. Rosenberg, T. J. (1997). HAARP imaging riometer diagnostic. (Report No. PLTR972101 // ADA3436797). Advanced Power Technologies Inc., Washington DC. Research Program imaging riometer diagnostic. Radio Science, 34(5), 1207-1215. 219. Rowland, H. L., Fedder, J. A., & Keskinen, M. J. (1993). Time dependent HIPAS/HAARP currents. Proceedings of 7th International Ionospheric Effects Symposium, 6B(1), 1.
plasma. Physics of Plasmas, 8(1), 36-47.
hybrid waves at fuh = 2fce . Geophysical Research Letters, 31(22), 1-5.
associated with up-shifted ionospheric stimulated radiation. Physica Scripta, 7(T84), 184-187.
analysis of ion energy balance. Journal of Geophysical Research, 105(A6), 12823-12832. Atmospheric and Solar-Terrestrial Physics, 62(6), 399-420.
of the auroral ionosphere under the influence of the Gakona HF transmitter . (Report No. 231. Sergeev, E. N., Grach, S. M., Komrakov. G.P, Thide, B., Leyser, T. B., Carozzi, T. D., & Holz, M. (2002). 232. Sergienko, T., Gustavsson, B. S. A., Brändstrøm, U., Rietveld, M., Leyser, T. B., & Honary, F. (2000). Held 16-23 July 2006, in Beijing, China, 1413. 235. Skone, S., & Cannon, M. E. (1999). Adapting the wide area ionospheric grid model for the auroral region. Canadian Aeronautics and Space Journal, 45(3), 236-244. Journal of the Institute of Navigation, 45(2), 117-127. No. AFRLVSTR020011668//ADA401940). Northwest Research Associates, Inc., Bellevue, WA. by Joule heating in the Auroral zone. Geophysical Research Letters, 24(4), 485-488. MEO. IEEE Aerospace Conference Proceedings, 2006, 1655750.
waves at high latitudes. Annales Geophysicae, 18(5), 532-546.
presence of ionospheric HF heating. Journal of Geophysical Research, 106(A4), 5579-5591.
waves. Journal of Atmospheric and Solar-Terrestrial Physics, 18, 2431-2433. 245. Strangeway, R. J., Russell, C. T., Carlson, C. W., McFadden, J. P., Ergun, R. E., Temerin, M., Klumpar, D.
of Geophysical Research, 105(A9), 21129-21142.
heating of the ionosphere. Journal of Geophysical Research, 110(A04216), 1-11.
applications. Proceedings of 1994 Symposium on Antenna Applications, (10), 1-28.
method. Geomagnetism and Aeronomy, 41(5), 632-639. Brekke, A. (2000). Irregular structures of the F layer at high latitudes during ionospheric heating. Io plasma torus. Geophysical Research Letters, 11(3), 263-266. 252. Thorolfsson, A., Cerisier, J.-C., Lockwood, M., Sandhaolt, P. E., Senior, C., & Lester, M. (2000). waves. Journal of Atmospheric and Solar-Terrestrial Physics, 62(4), 267-276. 255. U.S. Department of the Air Force, U. S. M. C., U.S. Department of the Navy, O. o. N. R., & U.S.
Alaska. (Report No. EPA number: 930238F). Notes: Volume 1–448 pages. Volume 2–407 pages. 256. U.S. Department of the Air Force, U. S. M. C., U.S. Department of the Navy, O. o. N. R., & U.S.
Alaska. (Report No. EPA number: 930073D). the edge of a small-scale irregularity. Radiophysics and Quantum Electronics, 44(3), 213-221.
ions. Radiophysics and Quantum Electronics, 40(5), 357-370. 260. Venkatraman, S., & Heelis, R. (2000). Interhemispheric plasma flows in the equatorial topside ionosphere. Journal of Geophysical Research, 105(A8), 18457-18464.
modes in the ionosphere by the HIPAS heater array. Radio Science, 31(1), 211-226. 263. Wagner, L. S., Benhardt, P. A., Goldstein, J. A., Selcher, C. A., Frolov, V. L., & Sergeev, E. N. (1999). G. (1994). Ion acoustic turbulence and the nonlinear evolution of kinetic alfven waves in Aurora . Geophysical Research Letters, 21(17), 1831-1834.
electric field environments. Journal of Geophysical Research, 106(A2), 1807-1815. No. ADA399992). University of Alaska Fairbanks, Geophysical Institute, Fairbanks, AK. AIP Conference Proceedings, (485), 18-34.
atmospheric science. Radio Science, 25(6), 1251-1267. 271. Wu, X.-Y., Horwitz, J. L., Estep, G. M., Su, Y.-J., Brown, D. F., Richards, P. G., & Wislon, G. R. (1999). precipitation and transverse ion heating. Journal of Geophysical Research, 104(A8), 17263-17276. 272. Wygant, J. R., Keiling, A., Cattell, C. A., Johnson, M., Lysak, R. L., Temerin, M., Mozer, F. S., Kletzing, C.
of Geophysical Research, 105(A8), 18675-18692.
simulation of small-scale structure and dynamics. Journal of Geophysical Research, A2(1795-1806). 279. Zhu, H. (2000). Small spatial and fast temporal ionosphere-magnetosphere coupling processes, Ph.D. thesis. So this begs the question: If there is nothing to hide and no smoking gun evidence of HAARP weather modification, then why close the server and disallow visits to their earlier version website pages? What are you hiding or removing HAARP guys? These guys are forever shooting themselves in the foot with self-incriminating actions. This looks like another one. As I continue to try to access this url noted above in the wayback machine, I am locating “other” documents that look way way worse. Each time I locate one I grab the text, the url, make a quick PDF and I will continue to post them to this page. Apparently the HAARP technicians have been installing some sort of technology in high schools, both along the west coast of Alaska, and along the east and west coast of the USA, for years, which is assisting them in their “HAARP campaigns.” Just exactly what the hell is a “HAARP campaign” anyway, and why are locals never made aware of these activities? Personal Author(s) : Bell, Timothy F.
Abstract : During the period of performance a program of instrument construction, technique development, data acquisition, and data analysis was carried out in order to characterize the auroral electrojet and the ambient and modified D-region directly above and near the HAARP (High Frequency Active Auroral Research Program) facility in Alaska. To accomplish this goal, five VLF D-region diagnostic systems were constructed and deployed in five High Schools near the HAARP facility and along the west coast of Alaska. In addition in order to characterize the auroral electrojet on a continental scale and to allow prediction of its location, four VLF D-region diagnostic systems were constructed and deployed in four High Schools on the east coast of the United States and Canada. Data from the complete array of D-region diagnostic systems was acquired during a number of Fall and Spring HAARP campaigns during the period of performance. This data was then used to determine the state of the D-region above HAARP during the campaigns and to provide information on the location of the auroral electrojet. The salient scientific results from the observations were published in the scientific literature and also reported at the annual RF Ionospheric Interactions Workshop in Santa Fe, New Mexico. In addition a portion of this data formed one of the bases of a Ph.D. dissertation completed at Stanford University. Descriptors : *AURORAE, *VERY LOW FREQUENCY, *ELECTROJETS, *D REGION, DATA PROCESSING, IONOSPHERE, HIGH FREQUENCY, ELECTRON DENSITY, DATA ACQUISITION, SCIENTIFIC LITERATURE. Copyright 3.8.11-3011 By Chase Kyla Hunter, All Rights Reserved. In January of this year I wrote about incidents occurring globally of dead fish, sea lions, birds, and jellyfish. Many of these incidents took place in the vicinity of the New Madrid earthquake fault, and speculation was rampant that HAARP testing might have played a role. 2010 ended with a rather ugly little Christmas present for the American people, delivered by the History Channel. I was still assessing the implications of this TV bomb that had been dropped, as the year turned. 2011 began with the bang of thousands of dead birds falling from the sky, dead fish washed up on river banks by the ton, dead seals, dead crabs, jellyfish, dead doves in Italy and millions of Americans scratching their heads over it. Sinkholes had begun appearing all over the world in 2010, much of this news being skipped over by our lamestream Big Media outlets who broadcast at the behest of White House directives, or so it would seem. Just as suddenly citizen journalists began reporting in January 2011 much odd and unusual activity in the New Madrid earthquake fault zone, which covers a sprawling 10 state region in the central USA. Truth researchers speculated as to whether HAARP testing in the region played any role. A dead government official, obviously murdered, had turned up in an east coast landfill weeks earlier, and suddenly there was an unlikely plethora of new dots to be connected. A new comet had been discovered on the winter solstice December 21st 2010, by a Russian amateur astronomer named Leonid Elenin. The comet was named after him, and astronomers began tracking the comet’s trajectory seeking to learn how closely it might be passing by the earth. Those reports, as they filtered in, b ecame worse and worse. The problematic “pole shift” phrase began popping up on blogs again, much as we all hated to use the over-worked term. The magnetic poles have now re-adjusted so frequently since 1994 that the Tampa Airport had to repaint the numbers aligning the runways to true north so that pilots can properly locate the magnetic pole and land their planes. While we were all pondering the truthfulness [ or not ] of the apparent emerging visibility of rogue brown dwarf Nibiru, a possible companion star to our sun [a binary sun system is the usual norm in the universe ] which never made it to full “sundom”, along with the masses of dead animals everywhere, a schizophrenic man in Tucson Arizona, Jared Loughner, who clearly had needed psychiatric help for years, gunned down Congresswoman Gabrielle Giffords and 19 others at a Safeway Grocery store speaking event, killing 6, leaving Giffords barely alive and fighting for her life. As horrendous as the shooting itself was, the appalling media melee that followed had me pondering life in Costa Rica as a possible “out” and escape hatch from the madness of America. I started another blog in late January 2011 just to record the stellar [ no pun intended ] number of amateur astronomer’s new accounts of strange aerial objects, manifestation, UFOS, “orbs” and new comets: Photonic Portal 2037. With the grieving and outraged American public still reeling from this latest tragedy, as if on cue, the Egyptian people rose up with a resounding roar and took to the streets by the millions, relentlessly demanding day by day that Hosni Mubarak, their Pharaoh-like Overlord and ruler for over 30 years, propped up by numerous US administrations, resign and step down immediately.Violence between the people and Mubarak’s military machine riveted the world, and Egypt’s Revolt of 2011 began to dominate the news for the next two weeks. A highly visi ble and public stand-off between the people of Egypt and Mubarak ensued for the next 18 days, only finally ending today when Mubarak resigned this morning, under direct applied pressure from the US and UK behind the scenes. Do we live in “Biblical Times”? You better believe we do. The posts listed below I have collected from the first part of 2011 and represent the connected dots which constitute MUST READING for new site guests trying to grapple with these events, just as truth researchers and writers do. I’m usually up until 2 am each evening trying to stay abreast of what’s taking place, and back at it again early the next day. If you find this blog helpful, I’d love to have you make a small donation to make sure it can continue to be here. Thanks, and I am glad you found my little outpost of truth reporting in a sea of silly meaningless media distractions like Lady Gaga, “Glee” [ most useless TV show award ] and Lindsay Lohan [most useless human being award]. May the truth continue to rise up and roar on planet earth, and may my true King of Kings return soon. We need Him desperately on this world. Could Comet Elenin Be the Prophesied Biblical “Wormwood” of Revelation 8:10-11? BREAKING: Mubarak’s Son Steps Down, Is Mubarak Next? CBS Atlanta Reports on the Chemtrail Issue: Courage Award for Actual TV Journalism! Kill Switch, Egypt Day Seven: Is There Hope for A Nonviolent End to the Egyptian Revolt? Yellowstone Super Volcano Caldera is Swelling: Overdue to Blow? What Was the Real Motive for the “Ancient Aliens” TV Series? Can Sarah Still Win If She Runs in 2012? Is This Still A Real Political Horse Race? Why Was Gabrielle Gifford Subscribed to Jared Loughner’s Youtube Channel Before He Shot Her? Is Nibiru Planet X Real? Follow the Money. New Sinkholes Appeared All Over the World in 2010: Another Portent of Nibiru’s Arrival?